The AHD-PIR18 is a high definition hidden spy camera that captures 1080p surveillance video. To record this video, I mounted a PIR18 in the corner of CCTV Camera Pros tech room. You can see that this security camera provides complete video coverage for small to medium-sized rooms. When I turn the lights off, the camera engages its built-in infrared LEDs so that it can see in complete darkness. When I turn this monitor off, there's now zero light in this room. 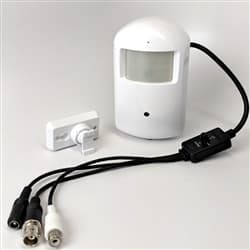 This motion detector camera uses a special type of IR LED that does not emit a red glow like traditional infrared cameras. People that entered this room will have no idea that surveillance video is being recorded. I'm going to turn this monitor back on so that I can safely make my way back over to the light switch. When I turn the lights on, the camera disengages the infrared night vision mode and records in color once again. The PIR18 is an AHD CCTV camera that must be connected to an AHD-compatible DVR in order to record. This camera captures 1080p HD video resolution. This camera uses a pinhole lens that is completely hidden inside a PIR motion detector housing. The 940 nanometer infrared LEDs are invisible. They do not emit a red glow like traditional infrared security cameras. Users can optionally use the built-in microphone to record audio surveillance to their DVR. The 3.7 millimeter lens provides a wide-angle 87-degree field of view. CCTV Camera Pros supplies the AHD-PIR18 for home, business, and government use. For more information and pricing, please visit www.cctvcamerapros.com/pir18. Thank you for watching.